T his update introduces the latest member of the BassZilla family – the Platinum Edition featuring the Fostex FE208EΣ (http://www.madisound.com). The Platinum Edition pleases me greatly in two significant ways. First, sound quality. The midrange is spectacularly clear, vivid, transparent, and exceptionally detailed, while the upper octaves are sweet and velvety in texture. The presentation has plenty of wow factor, very much electrostatic in flavor. Those of you who are familiar with my past love affairs with QUAD and Sound Lab electrostatic speakers should know that this is no coincidence. Another design goal was to expand the listening seat coverage for home theater applications making it possible for several listeners to enjoy the music without loss of tonal fidelity. This is impossible to accomplish with an 8-inch full-range driver, which beams like a flash light. Use of the Aurum Cantus G2Si ribbon tweeter (http://www.e-speakers.com/) and careful attention to vertical integration of the drivers, allowed for an increased sweet spot together with exemplary treble purity. Second, affordability. The BassZilla is a concept loudspeaker that provides a platform for various full-range and wide-range drivers. From the beginning, it was my intention to provide at least two alternatives, and the FE208EΣ represents a significant technology at an affordable price. Together with the Lowther full-range designs, these drivers represent prime examples of the lightweight cone, short voice coil, big magnet, design family. Because the moving mass of the driver (cone and voice coil system) is minimized, efficiency is increased for a given magnet size. The downside, however, is greatly reduced excursion capability. The Lowther DX4 is rated at a maximum excursion of +/-1mm, while the 208EΣ is not much better at 1.25mm. 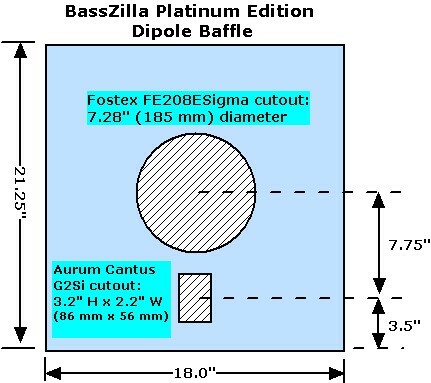 Excursion demands are severe in the deep bass, and increase with decreasing frequency and high power levels. A typical 8-inch woofer’s excursion capability is in the range of 6 to 8 mm or slightly over ¼-inch. Even that is insufficient for linear response at high power levels in open baffles or in ported enclosures below the box tuning frequency. The practical implications of all this are that designs such as the 208EΣ are subject to gross distortion and physical damage when pushed hard in the bass range. The solution, first implemented with the Diamond Edition, is to restrict the frequency bandwidth handled by the full or wide range driver. This may displease some purists who would likely object to the use of crossover networks in the context of full range drivers, but the proof is in the listening. A high-pass network with an effective roll off below 150 Hz reduces midrange distortion while improving dynamics and low-level detail resolution. The Fostex wide range is given the task of handling the core of the music, covering the upper bass and midrange bandwidth. The essential point about the 208EΣ is that it requires human intervention to sound its best. Its most ideal application, based on my investigations, is as an extended midrange. Not only should its bass extension be limited, but it has no business reaching beyond about 4 kHz. Yes, I have listened to it full range, and to be polite about it, its sound quality right out of the box is discouraging. There is a significant amount of “phlegm” in the upper midrange/presence region at 3.7 kHz due to a cone break-up mode and the treble is pretty coarse and uneven. Since the Aurum Cantus G2Si is an exceptional performer, I decided to give it full scope of expression by blending it in at 4 kHz. This strategy allows control over the break-up mode at 3.7 kHz and also improves vertical dispersion. The process of properly integrating and voicing the FE208EΣ and Aurum Cantus G2Si took several months. A major reason for this was that I meticulously evaluated all of the potential crossover options. The list of options included simple first order networks up to more complex fourth-order implementations. Promising options were first prioritized on the basis of measurements, and then each option was evaluated on the basis of listening tests. 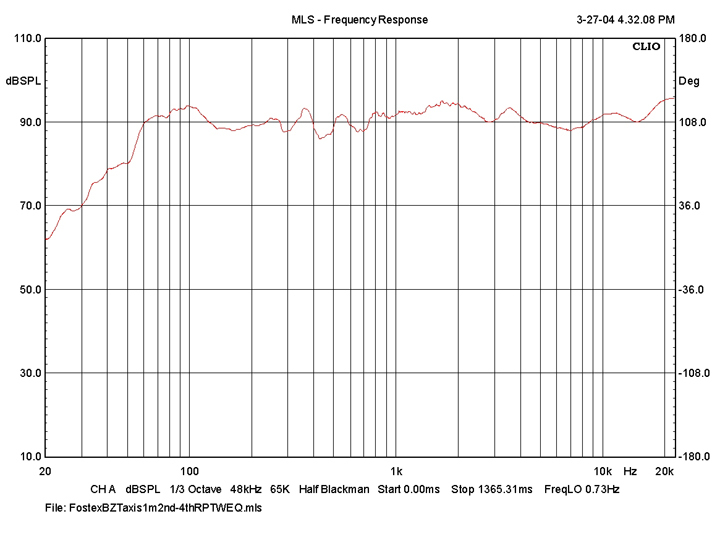 Frequency response measurements are poor at revealing the presence of distortion products and whether they are dissonant or consonant with the music. The perceptual impact of a particular network is best evaluated the old-fashioned way – by listening to its sound. A major component of the listening evaluations was the “Lesley Test,” the David Manley recording of Lesley Olsher, re-issued direct from the original master tapes as “Jazz Me,” (Black Dahlia Music, BDM78001). Lesley’s voice was invaluable in evaluating the harmonic correctness of competing network implementations. The job was not complete until Lesley sounded just right. Much nonsense has been written about crossover networks, typically by electrical engineers who overlook the basic fact that loudspeaker drivers do not behave like text-book electrical filters. First-order networks, provide a gentle roll-off characteristic of 6 dB per octave and offer desirable time-domain behavior, but give inadequate driver protection in most situations. Third-order networks with their much steeper 18 dB per octave slopes were championed years ago by non other than Neville Thiele. However, a giant step forward was taken by Siegfried Linkwitz in the mid 70s when he considered the effects of driver spacing and non-coincident driver acoustic centers in crossover design. When the spacing between drivers is equal to large fraction of the wavelength at the crossover frequency – usually the case between the midrange and tweeter – phase delays are generated relative to a given listening position. He introduced the Linkwitz-Riley network type based on cascaded Butterworth sections (second and fourth order) as a means of maintaining drivers in-phase at the crossover frequency and producing a symmetrical radiation pattern. In the past 15 years, the importance of also including the driver’s acoustic slope in network synthesis has been recognized and has lead to the development of computer-based crossover design programs. The ribbon tweeter manufacturer recommends a third order high-pass network at a nominal frequency of 2750 Hz in order to protect the tweeter from damage. Note that the ribbon element is easily destroyed when its excursion limit is exceeded. The fourth order network optimized and chosen for the G2Si is a Bessel type, meaning that its slope is transitional, starting off at 18 dB per octave before reaching the its ultimate 24-db per octave. 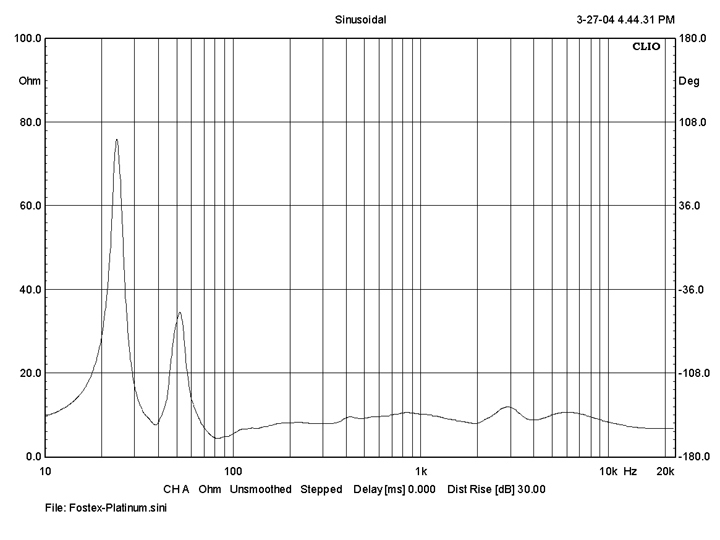 This filter type offers excellent protection and minimizes in-band distortion products. The tweeter is connected with reversed polarity to give in-phase response relative to the Fostex FE208EΣ. The tweeter was positioned below the midrange to bring the tweeter axis closer to ear-level. The original baffle dimensions were 19 inches tall by 18 inches wide. The baffle used during the design stage was slightly larger at 21.25” H x 18” W and is made of 0.75” thick MDF. It was built for me by DIYer Mark Cronander and consists of two sections: a fixed lower section for the tweeter and an upper section, which could be tilted back in a controlled fashion. The basic idea was to make it easy to investigate the sonic impact of various tilt-back angles. Since the final Platinum design does not require any tilt-back, I would recommend that you use a single-piece and vertically straight baffle. The spacing between cutout centers of the tweeter and midrange should be 7.75”. The standard BassZilla bass cabinet may be used with the Eminence Magnum 15HO (42 Hz box tuning; baffle cutout is 14.0 inches in diameter). However, several constructors have inquired about the possibility of a bass enclosure with a narrower profile. Such an enclosure would make more sense when matched with the Platinum’s 18-inch wide dipole baffle. Reducing the bass box height by say 6 inches is also desirable, as it better aligns the tweeter axis with a typical listening height. Therefore, the following bass cabinet alternative is suggested: 28” High x 16.5” Wide x 17.7” Deep (all dimensions are internal). The 16.5” width together with 0.75” thick side panels gives a overall width of 18” to match that of the dipole baffle. Of course, the rectangular vent dimensions are impacted by the change in profile. The rectangular vent dimensions become: 16.5” W x 2.0” H x 5.75” D.
The near-field (1 meter), in-room, frequency response of the Platinum Edition is shown below. The first response curve was measured on the tweeter axis, while the second on the Fostex axis. There is only a small upper midrange difference between the two curves indicating satisfactory vertical integration. The most notable features are a minor midrange emphasis plus a small bump at 3.7 kHz – a residual of the Fostex FE208EΣ cone break-up mode. The speaker’s impedance magnitude is shown below. The fact that the speaker’s impedance is fairly flat between 200 Hz and 20 kHz helps minimize response deviations due to the interaction of the amplifier’s output impedance with that of the speaker. And that is good news for amplifiers (i.e., single-ended designs) with 1-ohm plus output impedance.